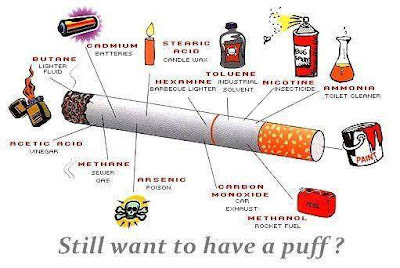 Stop Smoking - Do It Now: Why Do You Keep Putting All These Disgusting Chemicals Into Your Mouth? Why Do You Keep Putting All These Disgusting Chemicals Into Your Mouth? Cigarettes contain over 4,000 ingredients and here you see some of the real nasties. I am constantly amazed that production and sale of these revolting chemical sticks is allowed. I have to ask you - why on earth would you put these in your body? Is it any wonder that your breathing is constricted, you have a persistent cough, your skin looks dull and you are ageing before your time? You are a walking chemicals factory. You know it is time to stop but maybe you have tried to kick this weed but cannot quite manage it. Then I can help you, the e-a-s-y way with deep, relaxing hypnosis. My stop smoking in one session technique is very clever as it encompasses various add-ons to support the already powerful hypnosis eg NLP and Time Line Therapy. In fact, I honestly cannot remember the last time someone did NOT stop smoking with me. I am based in Portsmouth, UK but the good news is that I help people worldwide via SKYPE. You can be the next non-smoker, enjoying the freedom of a world without slavery to addiction. All you have to do is contact me, Antonia Harrison, the English Skype Hypnotist.